The media latched on to a few absurdly overblown stories to keep the bad vibes flowing during President Trump’s first overseas journey. Editorial judgment is apparently easy to suspend when the opportunity to hype an odd photo or curious video clip presents itself. 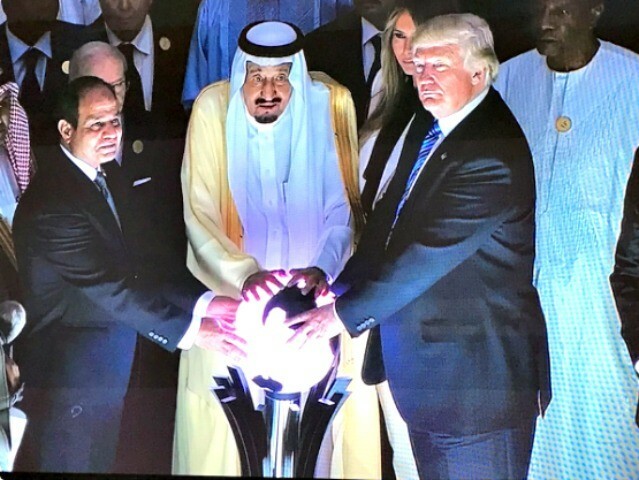 The Orb: By far the most entertaining non-story was the photo of President Trump, King Salman of Saudi Arabia, and President Sisi of Egypt posing with their hands atop a mysterious glowing white sphere. Internet wags had a field day coming up with humorous theories about the Orb, including the lively wag subdivision of Breitbart News, whose contribution made the New York Times roundup of Orb-related merriment. A good time was had by all, but really, there’s nothing terribly mysterious about the Orb. It’s not a relic from some obscure desert nomad ritual given a high-tech gloss by the Saudis, or an alien artifact, or a leftover prop from the Lord of the Rings films. It’s just a translucent globe of the Earth with a very bright light inside, which makes it look weird in photographs. It’s part of the decor at the high-tech new Global Center for Combating Extremist Ideology in Riyadh, and the three leaders were posing for a routine photo op. That orb is destined to show up in a lot of selfies. The First Lady swats President Trump’s hand away: Shooting wars have gotten less coverage than a few seconds of video that appeared to show first lady Melania Trump evading President Trump’s attempt to hold her hand on the tarmac in Tel Aviv, while walking the red carpet with Prime Minister Benjamin Netanyahu and his wife Sara. CNN analyzed what it called “the swat heard round the world” as if it were the Zapruder film, offering a variety of theories as to the meaning of Mrs. Trump’s 1.5 seconds of body language. Verdicts ranging from “awkward” to “she hates his guts” were rendered. Mrs. Trump’s facial expressions and posture were scrutinized for signs of her dismay with the business of being first lady. Signals from distant stars that might host intelligent alien life are examined less carefully than the signals Melania Trump is supposedly sending. As for the Ogre-in-Chief, well, the “experts” see nothing but brutish misogyny in his body language. None of that has anything to do with what people who actually know the Trumps say about the state of their marriage, but why let common sense ruin a good news cycle? If anyone needed further evidence that a great deal of modern reportage is driven by whatever “viral sensation” happens to float across the Twitter and Facebook pages of journalists, here it is. Hundreds of pages of news and commentary milked from one second of video is the best return on minimal effort since Jack planted a handful of magic beans and grew a beanstalk that punched through the stratosphere. Trump body-checks the President of Montenegro: The media flipped out over video from President Trump’s visit to NATO headquarters in Brussels that showed Trump apparently shoving the hapless Prime Minister Dusko Markovic of Montenegro aside, so he could claim a choice position in a group photo shoot. “The Balkan state is in the process of formally joining NATO, but membership, it seems, does not earn it a spot at the front of the line,” sniffed the New York Times. Now that you mention it, no, tiny nations that aren’t even part of the North Atlantic Treaty Organization yet would not normally stand in front of the Commander-in-Chief of the global hyperpower in a NATO group photo. Also, group photos are arranged by photographers and diplomatic staff, not shoving contests between world leaders. Of course, most of the media types trying to make hay out of the Trump Shove know this, since they work with photographers on a regular basis. Alas, even as new heights of media dudgeon were reached, Markovic ruined the fun by declaring he was not offended by Trump’s pat on the arm. Trump attempts to dismember French president with brutal handshake: Not content with tossing the Prime Minister of Montenegro around like a sack of potatoes, Trump also came close to crushing the new French president’s hand at the NATO summit. President Macron is but a student of Trump-fu. Melania is the master. Macron had to parkour his way across half of NATO headquarters to escape. Melania countered Trump’s iron fists with a mere twitch of her fingers. Veils at the Vatican: Melania Trump could not so easily evade the misogyny of the Catholic Church. The breathtaking hypocrisy of the Trump White House was laid bare when Mrs. Trump refused to don a headscarf in Saudi Arabia, but submitted to wearing a black veil at the Vatican along with Ivanka. How could the Trump women defy Islamic dress codes while obeying Catholic ones? This particular non-story had a short shelf life, because most media organizations already knew the answer. They still tried to milk it with headlines like “Melania Trump Wears Veil, But Not a Headscarf,” but the body text of the very same stories admitted the Vatican’s dress code is long-established and well known, while the Saudis did not even request she wear a headscarf. They don’t make such requests of visiting VIP women as a general rule. Furthermore, as Canada’s Globe and Mail noted, the Vatican is a holy site, and Mrs. Trump happens to be Catholic. She did not visit any holy sites in Saudi Arabia, where head coverings or the removal of shoes might have been required. The Trumps also respected religious traditions during their visit to the Western Wall in Jerusalem, which has a published dress code for visitors. Mr. Trump wore a yarmulke head covering when he became the first sitting U.S. president to visit the Wall. There are three main reasons we saw a brief shower of “Veil But No Headscarf” headlines: reporters noticed people were popping off about it on Twitter, they were hoping for a cheap “Islamophobia” hit, and they remembered Donald Trump criticizing Michelle Obama for not wearing a headscarf in Saudi Arabia. Try Googling stories about Melania and the headscarf from May 20th, and you’ll see a string of stories from virtually every mainstream media organization recalling that Trump “attacked” or “slammed” Mrs. Obama for declining to wear one. They’re also still pretty sore about conservatives mocking President Obama for bowing to the Saudi king, so they scrambled to make a story about Trump bowing too. The Memory Hole is very real, but there are some things the media does not forget.